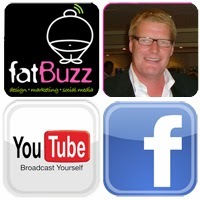 fatBuzz: Are you creating direct relationships, or is it Mr. Zuckerberg? Are you creating direct relationships, or is it Mr. Zuckerberg? I recently asked an audience to consider if they were creating direct relationships with their online community, or is the social media channel creating the direct relationship? My concern is this; the large mainstream channels are increasingly deciding what is shared, even to the people who have opted to receive your updates. Less than a year ago, we were being told photos are King; if you wanted to attract maximum engagement on Facebook you had to post images. Now, things have changed - videos are King. Yes, if you want engagement now you have to post video, and you have to post it directly onto Facebook. What has changed? It's really quite simple, Mr. Zuckerberg has decided to take on YouTube, so he's tweaked his algorithm again. Not too long ago he tweaked the algorithm to effectively reduce the reach of the posts on your page - as few as 2% of the people who have opted to Like your page will actually see any updates from the page in their News Feed. Why? Because Mr. Zuckerberg has to get some pennies back for the shareholders. Now, you have to Boost your post by paying to get it out there. Mr. Zukerberg has now turned his attention on video content, he wants to oust YouTube as the dominant video channel. So, the Facebook algorithm now feeds more video content to the news feeds. Yes, people are posting more videos - 75% more, but users are seeing a massive 400% more in their News Feeds than they were barely 6 months ago! Moreover, your video has a much greater chance of being seen on the News Feed if you upload it directly to Facebook rather than sharing a link from channels like YouTube. So, if you're still trying to engage with images, and you're not paying to boost your post, you're probably not reaching too many people, regardless of how engaging the content is. I therefore come back to the question I posed to my audience, are you creating direct relationships with your community? I suspect many of you are not. If so, it's perhaps time to take stock and explore how you can convert a Facebook Like or a Twitter Follower into something that isn't controlled by the social media channel. If you're going to succeed you need data, you need them to opt into something you own and control such as, a newsletter, your blog's RSS Feed, your podcast, your video channel, and don't forget your website. However, there is an upside to Mr. Zuckerberg's latest whim - create video content! Yes, if he's so intent in sharing video content, get it out there and let him do it. There's no doubt video is an extremely effective medium, it is very good at getting all kind of messages to all kinds of audiences. It's also much more accessible to even small businesses, it really doesn't cost that much to create engaging video in 2015. Large-scale viral campaigns like the Ice Bucket Challenge have also helped people to understand how to upload and share video content. They have also given lots more people the confidence to create video content. Currently, one billion videos are viewed on Facebook every day! So, let's run with Mr. Zuckerberg and get some video 'in the can', it really has to be part of the marketing mix - until the next time he tweaks his algorithm! Want to find out more about video for your business? If you'd like to find out more about the video revolution, I'm presenting this as the topic of the New Media Breakfast on Friday 27th March, you can get full details and booking information here.